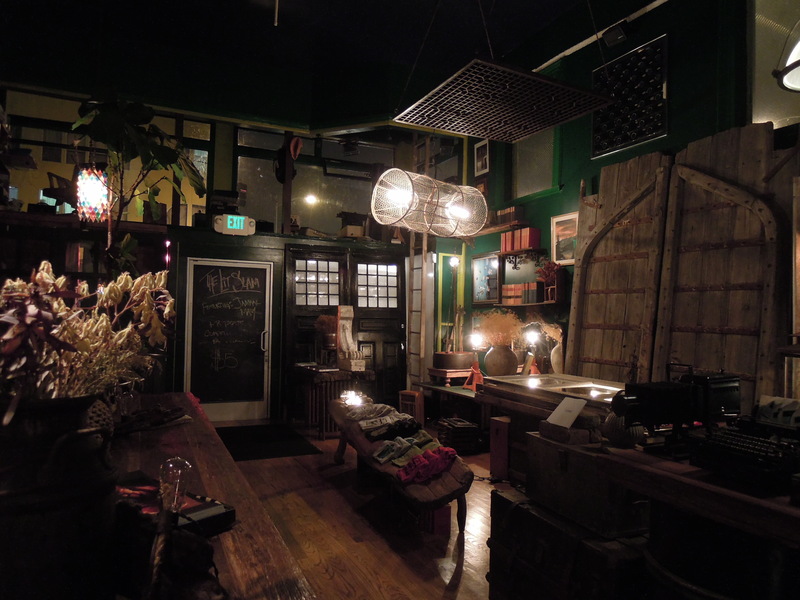 They’ve been hosting music at Viracocha, a boutique in San Francisco’s Mission District, for some time now. I finally made it to a show, and although it sounds weird to be holding music shows in an antiques shop, it turns out to be a delightful little venue. Viracocha sells clothes, antiques, and also modern sundries: soaps; poetry and fiction books; even CDs. The wooden decor gives the place the feel of a cabin in the woods, an outpost you’ve stumbled upon. 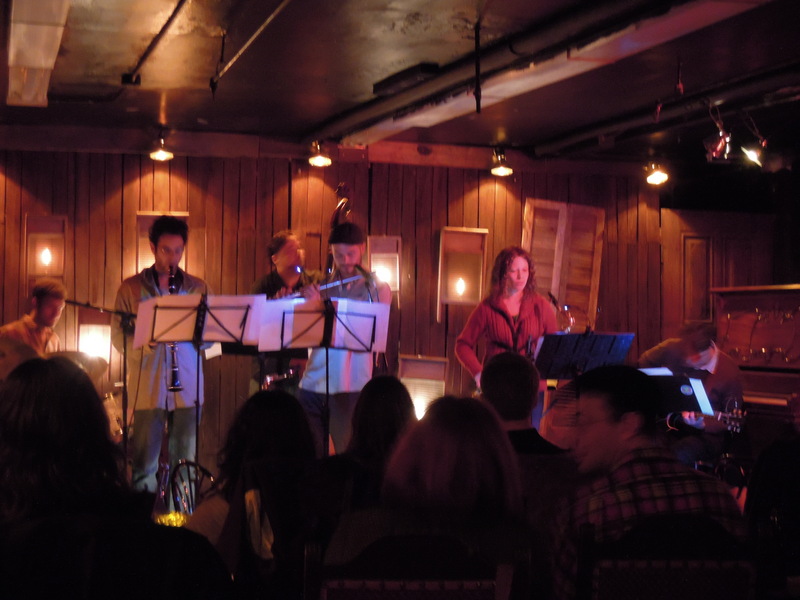 The music is hosted in a separate area entirely, down a flight of stairs in a basement theater area that’s quite nice, outfitted with tables and chairs, some living-room decor, and a stage that’s roomier than you’d expect. Viracocha has been hosting a variety of music, but of course I stopped by on a jazz night. They were followed by Lisa Mezzacappa’s Bait & Switch. The two bands have made it an annual tradition to do a show together around the holidays; they were just a little late this time around. Mezzacappa said Bait & Switch had a studio date planned for their next album. We were to be the last audience to hear the material before it got nailed down in recorded form, she told us. I don’t recall the titles, but the new songs sounded great. One was about the red ants marching up from Central America to destroy us all, and it was appropriately march-like and a little bit cartoony. Another song played some fluid games with tempo. Vijay Anderson laid down a clackety racket on drums while the other three members played simple patterns. Anderson then sped up and slowed down the pace, with the band following his cues to create a rubbery sound. 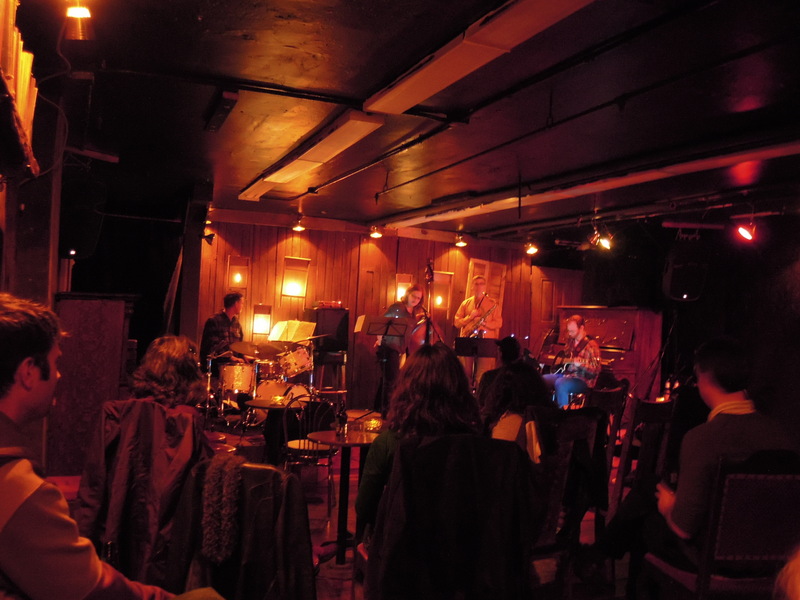 I’m hoping Viracocha can keep going as a music venue. It’s a good addition to the Mission District scene, it’s got a wide-open booking attitude, and it’s just plain nice. Booking is handled by Laura, who runs the cool Fenderhart blog and also blogs about upcoming live-music shows under the handle LiveNLocal. You can find out more by joining the Viracocha mailing list (there’s a link on the Viracocha site) or by following LiveNLocal on Twitter (@LnLSF) or Facebook. The Day of Noise happens all day on Sunday, Feb. 12. Listen at 90.1FM, stream at kzsulive.stanford.edu, and/or read more info on this blog. It’s not a 2001 homage. This is the front-stage speaker I stared at between pieces. The title here might imply I’ll be at Nights 2 and 3, on Saturday and Sunday. I won’t. And Saturday’s concert (Jan. 21, a.k.a. tonight) will include a backwards playing of “Revolution 9” — a “song” I know well enough that it would be really, really cool to hear backwards. Insert sad face. But I did catch Night 1 of the San Francisco Tape Music Festival, and it was pretty darned cool. I keep emphasizing the number of audio speakers that they place around the audience at this event, but there’s a more important fact that occurred to me last night: These are really, really good speakers. I’m not an audiophile, but — they seem really good. Crisp sounds and percussive sounds are so clear, you feel like you could reach out and grab them. Two John Cage pieces sounded appropriately chaotic and cut-up. Both consisted of instructions for building a sound collage using sources that are arbitrary but that come from set categories. “Williams Mix” called for six types of sounds (city sounds, country sounds, etc.). That one was fun — sounds blipped at you from all directions — but “Imaginary Landscape No. 5” was a more grand descent into madness. The San Francisco Tape Music folks put that one together themselves, using fragments of Cage’s own performances and lectures . It was a crazy mix of monologue and tiny music snippets, taking advantage of all 16 speakers around the house — and, adhering to the randomness required by the piece, it ended mid-sentence. Jacob Felix Heule, not taken during the concert. It’s from heule.us. Bay Area drummer Jacob Felix Heule‘s “Counterpoint” was created by overdubbing one electronics improvisation and three percussion improvs, each performed without listening to the previous takes but with conscious attention to the memory of those takes. Heule did edit the final result a bit, so the disparate pieces did fit together nicely. Each improv included lots of long silences, so you weren’t bombarded, and some of the starts and stops were aligned very nicely, a product of the editing, I’m assuming. Thom Blum‘s “Couplings” was full of sour, grumpy sounds that I found interesting. These are supposedly paired with something more mellifluous, but I couldn’t find that element. Maybe I was distracted by the rain on the roof (which was usually drowned out but caught my ears during this piece), or maybe I was looking for the wrong thing. “Στέρφος” (“Sterfos”), by Orestis Karamanlis, ended the program. Inspired by the sounds of his home in the Greek isles, the piece opened and closed with splashing water — delicious sounds, altered in places to sound almost like a verbal language. (Or, maybe listening to splashing for that long alters your perception of the sound, like saying a word repeatedly until it sounds funny?) There were also snippets of synthesized symphonic chords, folk music (or am I imagining that after the fact? ), marketplace crowds, people talking in Greek… and loud sounds like firecrackers or gunfire. Not sure if that was also tied to life in Greece or if it was just electronics gadgetry added — the piece, composed in 2009, did use lots of modern computer-generated sounds as well. The 21-minute span, longest on the bill, was episodic; it did feel like Karamanlis was telling a story, in an abstract narrative-less sense. This piece won a 2010 Giga Hertz Award for Electronic Music. You can hear stereo versions of the whole thing on Karamanlis’ web site (linked above) or on Bandcamp. So, weather be damned, you should set aside time for the festival Saturday or Sunday. The new ODC Theater is cozy and sleek, and the ginger snaps at the mini-cafe are yummy. One tip: Sit in the center. Meaning, not to the left or right, but as close to the middle as possible. The stereo balance will be much better. As for whether you should sit to the front or the back — I dunno. In many pieces, most of the sound seems to come from the front, making it a pleasant surprise when sounds blip out from the back speakers. It might be a real treat to actually sit back there. I want to try that next time. “Glassy Metals,” off this album, is due to be performed at the San Francisco Tape Music Festival on Friday night, Jan. 20. The pieces on this CD give you a glimpse of the cinematic possibilities in soundscapes, or “tape music,” or computer electronics — whatever you want to call it. The sounds move from speaker to speaker, and with changes in volume, you can almost feel them surging closer, then farther away. Imagine what could be done with a ring of 16 or 20 speakers surrounding the listener. The last minutes of “Distant Thunder” feel like they up the air pressure, as if you’ve been enveloped. It’s interesting to hear in headphones, but the sound cries out for a more three- (or, really, two-) dimensional representation. 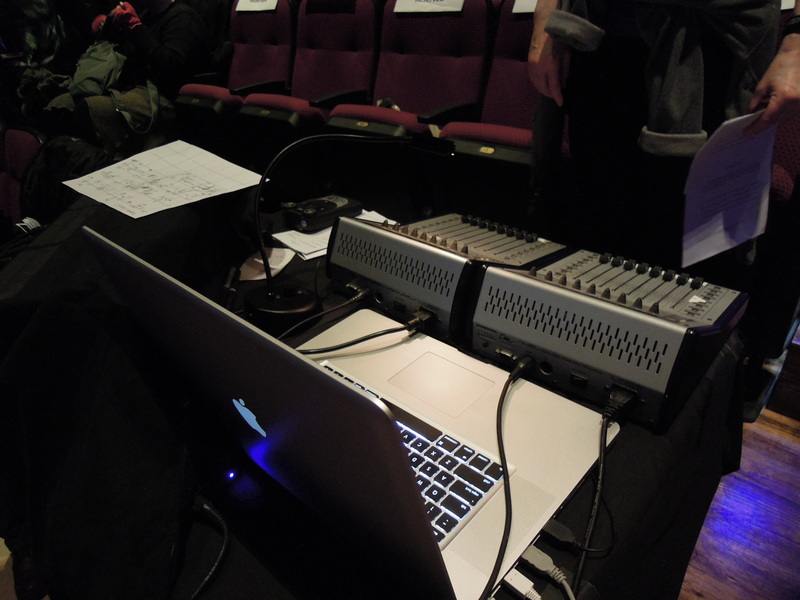 Of course, that kind of setup is exactly what the San Francisco Tape Music Festival is all about — see previous entry. Maggi Payne lives and breathes this kind of stuff. A co-director of the of the Center for Contemporary Music at Mills College, she’s been creating these kinds of pieces for decades. But Payne’s artificial world gives us something that really sounds like it should be called “Arctic Winds.” It’s an eerie place, full of dark, agoraphobic moods. “Fluid Dynamics” does sound like surging cold winds, one furious wave after another, with pauses consisting of uneasy rustling. “Apparent Horizon” is a warmer track, full of cricket-like sounds and even some direct samples of astronaut communications, which ironically provide some of the more down-to-earth moments of the album. “Glassy Metals,” being performed tonight at the Festival, struck me as one of the smaller tracks on here, in terms of force-of -sound. It’s a series of sounds, actually, a chain of episodes: insects in a warm swamp, steam rushing through pipes, a pulsing machine. It’s a showcase of sounds, tickling the ears in different ways. In that sense, it’s a fine choice to showcase in a bigger environment. On a more down-to-earth level, Payne’s liner notes provide fun descriptions of the sounds and inspirations that went into the album. Most of them are quite simple (ball bearings rolling and clacking against things seems to be a favorite) but are then transformed into something otherworldly. BART makes an appearance on “Glassy Metals,” although you can’t recognize it. Ironically, a very BART-like sound appears on the next track, “Fizz,” which did use fizzing as a sample — one that apparently wasn’t easy to get, either. It’s John Cage’s centennary year, and of course the annual San Francisco Tape Music Festival is taking notice. Each of the three nights will include two Cage pieces. Separately, each night includes a taste of the first recordings ever, from 1859. They’re called phonautograms, and while they were originally created as a way to visualize sounds on paper, the folks at the First Sounds organization have come up with a method to play back the sounds. The bulk of the program will consist of more recent works, many of them by local musicians. I wrote about the Tape Music Festival back in 2009. The idea is to present pre-recorded sound as an art form… but it’s not so simple as dropping a CD in the player. 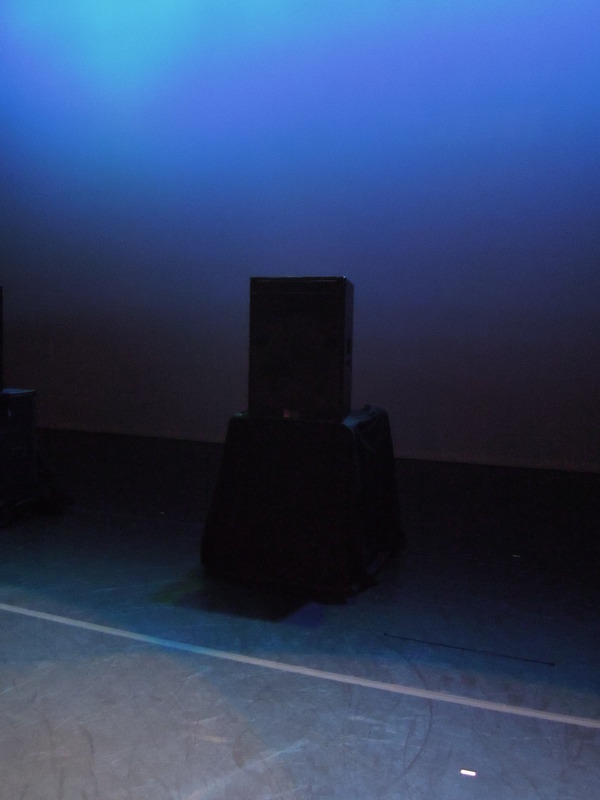 The pieces are performed in darkness (they do turn up the lights after each one) on speakers that surround the audience; the show I attended used 20 speakers. “Cinema for your ears” is how the organizers at sfSound describe it, and that’s quite accurate. The “tape music” moniker is outdated, of course; almost all the pieces will be digital files. The term goes back to the 1950s or earlier, when the concept of using prerecorded sounds as part of a classical piece was radical. You get some amazing sounds in these pieces. They’re what you often hear from laptop electronics: watery sounds, metallic sounds — but realized in big, dramatic fashion. It’s a pretty cool experience. The 2012 San Francisco Tape Music Festival takes place Fri. Jan. 20 through Sun. Jan. 22 at ODC Theater (3153 17th St., SF). You can see the whole program and lots more information at the festival site: http://sfsound.org/tape. UPDATE: It looks like Westbrook will be playing first, followed by Grex and then Reconnaissance Fly. Plan your lives accordingly. Having written so much about our local Cardiacs tribute band, I should probably mention it when those musicians get together with their own band. Did that make sense? What I meant is: The seed of the ReCardiacs Fly tribute band was the trio called Reconnaissance Fly, a separate non-Cardiacs-tribute band that’s been together for some time. They haven’t played in a while as Reconnaissance Fly, that I know of. They’re appearing tonight (Weds. Jan. 11) at Cafe Revolution in west Oakland: 1612 7th Street. Reconnaissance Fly will be opening a bill that’s headlined by Grex, the chamber/pop duo. In between, Luke Westbrook will do a set of jazz guitar. It’s all part of Light a Fire, a blanket name for the show-booking efforts of Karl Evangelista (half of Grex). I’d written about some of his organizational efforts here and here. Joe Lasqo performs Weds., Jan. 11, at Meridian Gallery in San Francisco. Joe Lasqo’s Turquoise Sessions album consists of ragas and similarly long-form Asian music, realized on the piano. He stirs some blue notes and soulful jazz into the slow-brewing mix, as well as some modern-classical ideas. It’s sometimes contemplative but certainly not static. That’s not his only trick. At his show Wednesday night, he’ll be displaying some very intellectual-sounding piano work and some laptop experimentation as well. “Deconstruction/resynthesis of Miles Davis and cool jazz via linguistic theory & finite state machines,” one part of the bill reads. Things like that. I’ll let him tell it himself, as he’s got a blog entry that pretty well describes his plan for Wednesday’s show. He’ll play some laptop along with his piano and will show off a new raga he’s been performing. As for the ragas and “Neo-Gaku” songs on Turquoise Sessions, they’ve got their relaxing side but (like traditional ragas) reward long spans of attention. You can get wrapped up in these pieces, and the jazzy twists in the two ragas add some welcome spice. The longest piece, at 25 minutes, is “Enteraku in Mode Hyo.” I have to admit, I was wondering if it would be 25 minutes of wandering in the desert, but it turns out to have lots of listener footholds, especially a repeating, ladder-climbing motif of high notes that feels very placidly Japanese. It’s also got occasional chordal washes that resemble the strumming of a koto or harp.